I am a huge fan of Frank Patterson’s bicycling drawings. When I study them, I am inevitably drawn into the scene. I long to be there among those enjoying a bicycle outing in the countryside. Occasionally, I am fortunate enough to actually ride through areas that remind me of his scenes. So I smile because I realize that, for a few moments…and in a small way, I’ve become Frank Patterson’s art come to life. 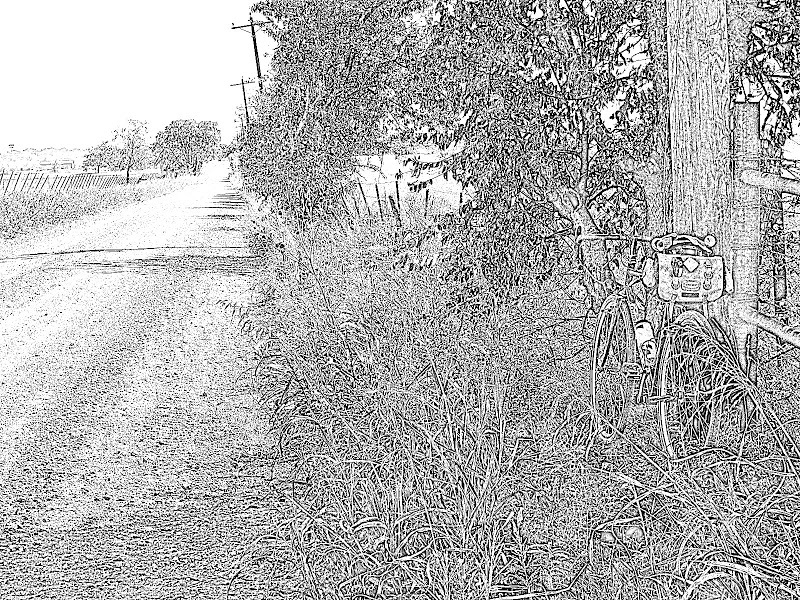 While playing around with Picasa’s photo editing tools and a photo taken from today’s Sunday afternoon ride, I accidentally stumbled on an effect that reminded me of Mr. Patterson’s style. A computer doctored photograph is no substitute for a master’s art. But it does provide me this opportunity to honor his work, and perhaps lead someone new to enjoy it. Nice work there! Cool effect. Very nice photo enhancement!I became interested in Frank Patterson's cycling art many years ago when I was a subscription only member of the Cyclists Touring Club. Their club publication "Cycletouring" often had reproductions of Patterson's art.Subsequently, I purchased two books compiled by Jim Willis in Britain of Patterson's works. These books were "The Frank Patterson Picture Book" (c.1978) and "The Art of Frank Patterson" (c.1979). Both books were published by the Cyclists Touring Club.These books are a joy to look through. I like your work with your photo. I think I hear what you're saying about computer manipulated photos. There is probably a level of artistry to be found too. Your photo is certainly pleasing.A quick search provoked some thoughts. I like Patterson's stuff. Black and white. Strong lines. Open. Interiors and voids. A block print feel. Simplistic. Allowing me room to roam.What little I've come to identify about you, I'm not surprised you're a fan. Old school values of cycling. Wide open space. Freedom.Thanks for the heads up on a cool,unassuming talent.